When viewing a work of sand art by Andrew Clemens it is almost impossible to imagine how someone could create such a thing. To perfectly manipulate individual grains of sand in a bottle to illustrate words and images is unheard of. However, Andrew Clemens, a 19th century artist, mastered a technique to do just that, creating remarkable objects that are highly sought after today. 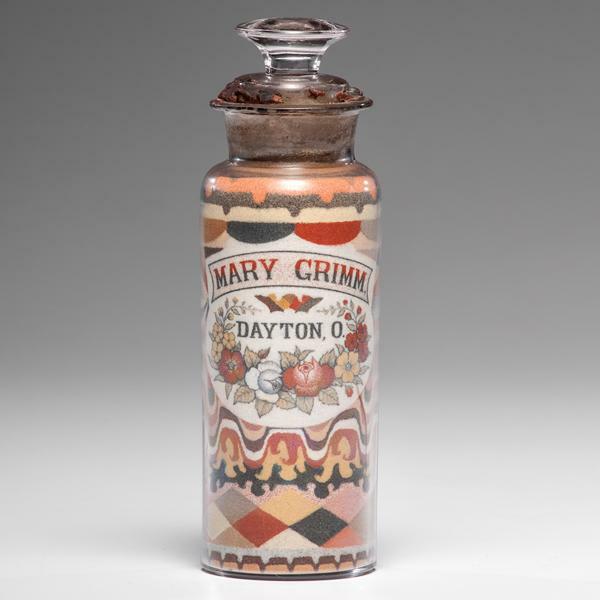 Upon completion, Clemens would seal the bottle and adhere a label to the bottom detailing the origin of the sand, his name and location. Few of these magnificent creations exist today due their fragility. However, those that have come up to auction have sold for high amounts. 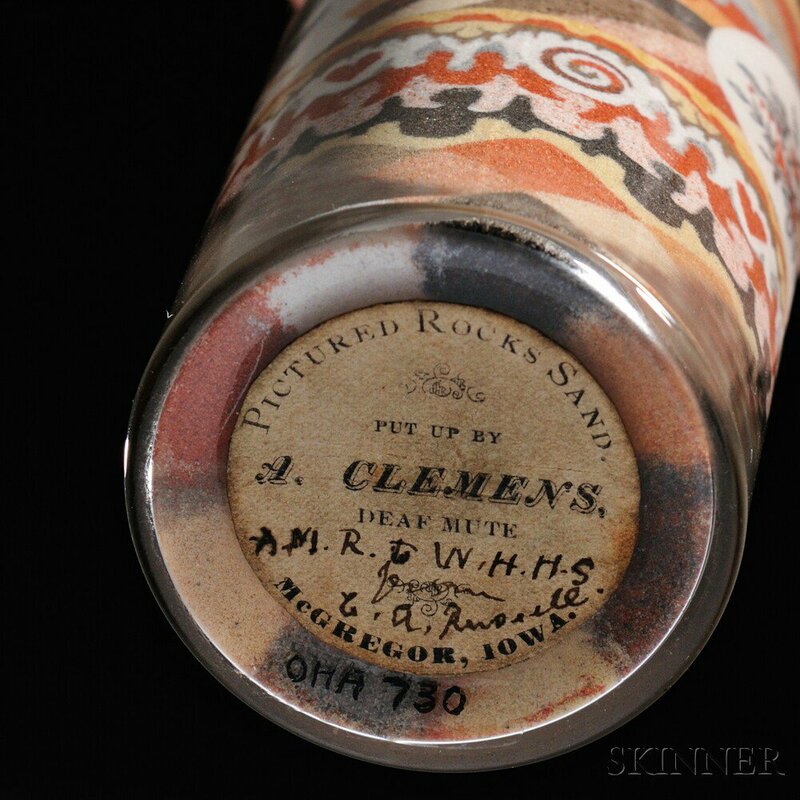 The pictured work of sand art by Clemens c. 1890 sold at Skinner in 2016 for $81,180. On one side is a carefully crafted eagle holding an American flag surrounded by geometric patterns, while on the other is a dove above a floral motif with a continuation of the colorful all over design. The object far exceeded the estimate of $8,000-12,000 proving that collectors vie to have one of his works in their collection. The wonderful sand art has also been featured in two episodes of the PBS series Antiques Roadshow. Discovered at the 2002 Hot Springs, AK event, a man brought “colored sand in a jar” that had been presented to his Great Grandfather from two of his friends. Wes Cowan appraised the object by Clemens for an auction estimate of $4,000-$6,000. The clip can be watched here. 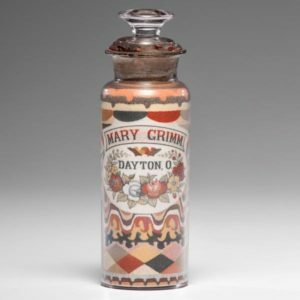 More recently, an Andrew Clemens work of art was featured on a Harrisburg, PA episode that took place in the summer of 2017. 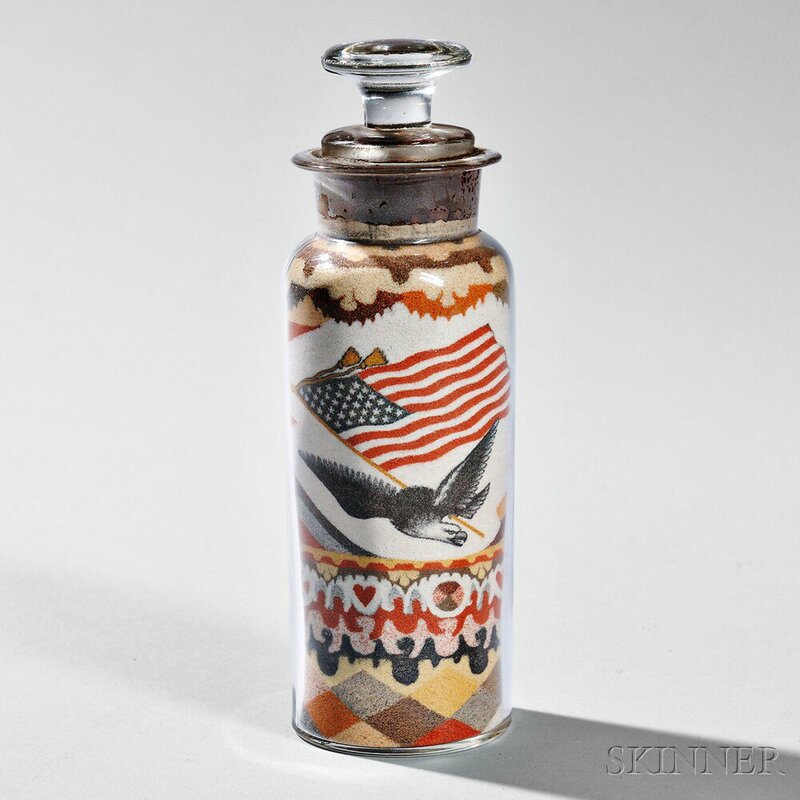 Appraiser Allan Katz informed the owner that the one-of-a-kind jar would retail for $30,000-$50,000. The clip can be watched here. Sadly, Andrew Clemens died of tuberculosis in 1894 at the age of 37. His sand art is remarkable. It took patience, precision, and perfect technique to craft such objects that have yet to be recreated today.